This is not the first time I've dreamed about the number 17. Here is a previous dream from 1999, which I felt was very important. 10-28-99 - DREAM - I was working in a large office and had a lot of work to do. I was working in a brightly lit office and my desk was full of work. Still, I spotted some legal papers or formal paperwork that was supposed to have been done earlier and I had not done it. I kept pushing it aside in favor of the engineering work I was doing. One of the engineering blueprint books was on my desk. It was 1 foot wide by 5 feet long by 3" thick. (153) I didn't know why the engineers hadn't filed it where it belonged so I took it off my desk and put it on top of the bookcase for later. There was so much engineering work to do yet, that when 4 engineers came in (all engineers I had worked with before in real life) they decided to have a conference in the library. So I went with them because I wanted to hear what they had to say. There was a square table with 4 chairs around it right under the bright light, but the engineers took the chairs and even the table and moved them out of the light. I said to the engineers, "Hey guys! I'm still working!" I had to be in the light to do my work. So, I went back to my own desk where the bright light was and saw the legal papers, which were now divided into two piles, standing up right in the forefront of where my work was. I felt guilty about not doing them, but moved them aside again to work on the engineering work. Finally, the work day being over, I went to my apartment which was in the same building. Even there was a lot of people. My apartment had two doors which I wasn't aware of right away... an inner door and an outer door which led to an outer hallway. One door was #17 and the other door was #36. I discovered this because while I was talking to some visiting women that there were some gentle knocks on the door and when I opened the door I saw the number. Someone came to the #17 door first which was on the inner hallway, and then a gentle knock came on the other door which was #36 which led to the outer hallway. When I opened the #36 door, the whole door fell off the hinges and fell on the floor. There were lots of people out there and they all started coming into my apartment. I immediately hollered, "MAINTENANCE!" The maintenance man was standing right there and he stood there and laughed... "I'll fix that right away!" As the Talmud Yerushalmi points out, thirty-six is a number that alludes to the supernal light of creation, the special light that Adam had use of for thirty-six hours in the Garden of Eden before G-d hid it for the thirty-six righteous people in every future generation! 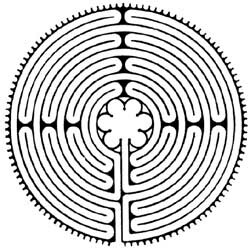 This 36', eleven circuit labyrinth is on the grounds of the Church of The Good Shepherd in Tequesta, Florida. The eleven circuit, or Maltese design, octagonal in shape, can be found at Amiens Cathedral in France. 12-8-2002 - DREAM - I was with a man who was a film-maker. He had a new concept of teaching people to read. He was showing us the words. The words themselves were English letters, but had no vowels - only consonants. One of the words appeared and where the vowel should have been in the word, there was a circle with the number 17 in it. When I saw the number 17, I heard the name 'Muhammad'. At the same time, I woke up, and the 4th toe on my right foot got a cramp in it that was so bad, I had to jump out of bed and stand up to make the pain ease. I then lay down and went instantly back to sleep. The dream continued: I and another woman saw a film of a bar scene. The scene had an Indiana Jones type of atmosphere - a huge room with a high ceiling, smoky atmosphere, rough-looking men with black hair and mustaches - a middle-eastern feeling. The men had a round ball that looked like coconut with a seam all the way around it. This object was swung on a long rope from the ceiling and this ball swayed and swung a number of times until the exact right moment and someone would have a special 'knowing' to grab the swinging ball and crack it open and 'drink' whatever was in it - prior to that time, it wouldn't be ready to drink. When I saw that film, I also knew that how one learned to read - it was 'word recognition'. One had a 'knowing' that the letters one saw in front of them sounded a specific way - that was reading - the 'knowing'. I and the other woman called the film-maker into our room to show him this film and show him what reading really was. So the film-maker, sat in the brown chair, and the film was projected on a white screen on the wall and again we watched the film of the brown ball with the seam all around it swinging back and forth until one of the men got that 'knowing' when to crack the ball open and drink what was inside of it. When the film ended, we had a little girl there about 7 years old. She had a bright face with an eager look in her eyes and we told the film-maker that this little girl learned to read in this way - when she got that 'knowing' on sight with the words. This is Sura 17:1 of the Quran: [17:1] Most glorified is the One who summoned His servant (Muhammad) during the night, from the Sacred Masjid (of Mecca) to the farthest place of prostration, whose surroundings we have blessed, in order to show him some of our signs. He is the Hearer, the Seer. DREAM - I went out into the country to look at farm land. At a distance, I saw a group of men, walking along the road, also inspecting the land. They walked into a ripe wheat field which was ready for harvest. I heard one of them say that he owned this 40,000 acre piece of land. NOTE: That is a large piece of land by American family farm standards. My in-laws owned 120 acres and rented another 100 acres in order to eke out a living and one of the boys sold insurance on the side to bring in extra money because there were price controls on the milk from the cows and they couldn't make ends meet. My husband picked me up at the some point with the car. We were driving on a service road alongside a major highway. He stopped at the gas station where they had food as well. I got out of the car and he took off after I told him to take the highway back to Milwaukee. The service road ended at this small intersection. He nodded like he understood and then suddenly turned and went the opposite way, heading north. I needed to get back to Milwaukee so started walking, hoping I could hitchhike back to town. I was wearing summer sandals, not prepared to walk for miles through snowdrifts, which I saw ahead, but I started walking anyway. I hadn't gone too far when two girls came up behind me. I asked them if they had access to a vehicle. They said, "No! ", but they might be able to get me some help and asked me where I was headed. I told them I needed to get back to Milwaukee within the week - not wanting to rush them. They said they would help me, so I followed them through a narrow gate that went through a high white stucco wall. We went through a narrow passageway, walking on a narrow concrete walkway that had drainage holes full of water every 3 or 4 feet. We came to a heavy blue door and one of the girls opened it and we went inside. Inside the house was an Arab family. It looked like they were about to eat dinner, but they were seated at a series of tables - praying. The Father of the house was not sitting at the end of the table, but in the 1st seat to the left of the end of the table. The small children sat across from him. He was dark-haired with a large dark mustache. He was reading and praying in Arabic. Then he asked one of the teenage boys to read from their book - they also spoke in Arabic. The boys were sitting at a separate table by the far wall with an open book on the table in front of them. Along the wall was a narrow brown table just for praying. That's where the dark-haired girl went and sat down. The blonde girl went to a different table and sat next to a girl who looked just like her. We had obviously come into the house a prayer time before dinner. I saw some extra chairs along the far wall, which I could move to whichever table I wanted to sit at. I was going to move one of those 3 chairs over next to the dark-haired girl who was sitting at the narrow prayer table - and woke up. 17 is a prime number. The Prime number 17 was called by the Pythagoreans - opposition, obstruction, and evil, and the day the Devil triumphed over God. This number hums with the astrological nature of the planets Saturn and Hades, and the zodiacal sign Capricorn. The number 17 also means: Young goat, Capricorn Zodiacal sign, seethe, boil, dream, rave, old, discourse, daze. I (Dee) find this interesting since my own Zodiacal sign is Capricorn and I'm a dreamer. The number 153 is the number of fish caught by the new Apostles when Jesus taught them how to fish. It was important which side of the boat they cast from. It is very significant that they had to cast on the RIGHT SIDE to catch the 153 fish. If we are suppose to win everyone, the type should have shown them catching ALL the fish in the sea. Then it should not have mattered (for the type) WHICH side of the boat they cast from. It is very significant that they had to cast on the RIGHT SIDE to catch the 153 fish. (1)Matthew 25:33. SHEEP on RIGHT...GOATS on LEFT. (4) the fog and clouds of habit and history. All of them have to go before we move forward. As we strive to change, the masks and armor fall away and we reach a clear perception of ourselves. The walnut is a paradigm of suppression, representing all the manifold efforts of dishonesty to prevent us seeing ourselves as we really are. The walnut is bound up with the prime number 17 which is also the value of the Hebrew word for SIN. It describes an arrow shot wide of the mark, and represents the natural world severed from all its spiritual connections. The raw material of our bodies, the tools with which we strive to serve the Spirit of Hashem's will for us. In the description of a soul surveying its body at the end of a lifetime, searching for assets to salvage from the wreckage of the past, it is written (Song of Songs), "I went down to the grove of walnuts to Look and See..." The Kabbalists saw in the shape of the walnut many interesting things. The Kernel is reminiscent of the brain, with its convolutions and striations. But whereas our brains have two lobes the walnut has four lobes. The universe, according to the Kabbalists has four "lobes". The walnut has been used to imitate symbols from the "Celestial Chariot" of Ezekiel, to the concept of Adam and Eve in the Garden of Eden. According to the Book of the Balance of Jâbir Ibn Hayyân, alchemist and Sufi, the form (sura) of any thing in the world is 17; the number 17 represents the base of the theory of the Balance and has to be considered as the rule of the balance of each thing. The seventeen Judges since the death of Josuah until Samuel: Othonial, Aod, Samgar, Jahel, Deborah, Barac, Gideon, Abimelech, Thola, Jair, Jepheth, Abezan, Ahialon, Abdon, Samson, Eli and Samuel. The Ten Commandments of God were given in 17 verses to the twentieth chapter of the book of the Exodus. The Pentateuch contains 5852 or 17x7x7x7+7+7+7 verses. 1533 verses of the Genesis can be also expressed like 17x70+7x7x7 or 17x7+707+707. The book of the Exodus contains (17+17)x(17+17)+57 or 1213 verses. It is 17x7 shorter than 666+666. Number: 17: The power of 7 acting through the agency of 1. Receptivity to Divine Will in action. When we meditate, all sense of separation between the meditator and the object of meditation dissolves, and it is us who is being meditated by the One. Meditation means learning how to get out of the way so that meditation can occur through us as an instrument for the One who continually meditates ALL into existence. The eternal truth that we of our (false, illusory, separate) self, do nothing. Meditation is the activity by which this is ultimately revealed to us. Also since 17 reduces to 8, meditation shows the means "whereby knowledge of the Great Secret is attained." "Where Key 16 is filled with darkness, action and destruction, Key 17 is filled with quiet, peace and profound beauty [...] If we are to experience true peace, we must undergo the destruction of our false towers of isolation. "7 Study of this tarot key helps one to develop greater receptivity to the Truth. stands out very prominently as a significant number. It is not a multiple of any other number, and therefore it has no factors. Hence it is called one of the prime (or indivisible) numbers. What is more, it is the seventh in the list of the prime numbers. The series runs 1, 3, 5, 7, 11, 13, 17, etc. Thirteen, it will be noted, is also a prime number, and is therefore important; but it is the sixth of the series: hence it partakes of the significance of the number 6, and is indeed an intensified expression of it. In like manner seventeen being the seventh of the series, it partakes of and intensifies the significance of the number seven. Indeed, it is the combination or sum of two perfect numbersseven and tenseven being the number of spiritual perfection, and ten of ordinal perfection. Contrasted together the significance of these two numbers is clear; and when united in the number seventeen we have a union of their respective meanings, viz., spiritual perfection, plus ordinal perfection, or the perfection of spiritual order. which concludes the first great division of that all-important Epistle, and sums up the blessings of those who are dead and risen in Christ. First we have a series of seven, then a series of ten. The seven are marked off by being put in the form of a question, while the ten are given as the answer to it. shall be able to separate us from the love of God which is in Christ Jesus our Lord." Thus is set forth the spiritual and eternal perfection of the believer's standing in Christ. 9. And unto the city of the living God (2). 17. And to the blood of sprinkling that speaketh better things than that of Abel (10)." Here again the blessings of the New Covenant are seen to be higher than those of the Old, both in number and in importance. The Old were spiritual (7), but the latter are more so, for they are doubly the manifestation of Divine grace, ten, or 2 x 5.
gives us the ten and the seven in a different order. Verses 6-9 give us a confederation of ten enemies for the purpose of making Israel extinct, and "to cut them off from being a nation"; while verses 10 and 12 give us an enumeration of seven enemies which the Lord had destroyed in the past, with the prayer that He would do to the confederacy of the ten what He had done to the seven in the past. The commentators agree that no such confederacy can be found in the past history of Israel, so that we are shut up to the conclusion that the Psalm is Proleptic, and speaks of a yet future confederacy of which the later Prophets speak more particularly. The number seventeen (not the word merely) has a significance of its own, and therefore an importance which must be taken into account wherever it appears in the Word of God by itself or as a factor. 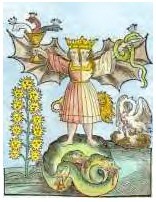 The first alchemical work to appear in the West was a treatise attributed, like many others, to Hermes Trismegistus. According to Leo Stavenhagen, this attribution derives from Robertus Castrenis, who translated the text from Arabic into Latin in 1182. It was later published in Paris, in 1559, under the title: "Booklet of Morienus Romanus, of old the Hermit of Jerusalem, on the Transfiguration of the Metals and the Whole of the Ancient Philosophers' Occult Arts, Never Before Published. The story concerns Khalid, a king who had looked for many years for a man described as "Morienus the Greek, who lived as a recluse in the mountains of Jerusalem," because he wanted to find out from him the secret of the "Great Work." The king has occasion to travel to another town, where a man comes to him and tells him that he has made his home in the mountains of Jerusalem and knows a wise man, a recluse, who possesses the knowledge that the king is looking for. After warning the man about the punishment he can expect if it turns out that he is lying, the king gives him many gifts and arranges for him to lead an expedition in search for the wise man. The narrator Ghalib, who accompanies the expedition, relates how they finally succeed in finding the wise man. He was tall of stature, though aged, we read, and although lean, so noble of countenance and visage that he was a marvel to behold. Yet he wore a hair shirt, the marks of which were borne on his skin.  At their bidding, he agrees to come to the court for an audience with the king. When the king asks the man his name the answer comes: "I am called Morienus the Greek." The king asks how long he has lived in the mountains and learns that Morienus has been there for over one hundred and fifty years. Well pleased with this stranger, the king gives Morienus his own quarters and begins to visit him twice every day. They speak of many things, and grow very close. Finally, one day the king asks Morienus to tell him about the Great Work. Seeing that the king is worthy of this, Morienus tells him that he has achieved initiation, and agrees to instruct him, emphasizing that nothing can be achieved if it is counter to divine will. He speaks of how God "chose to select certain ones to seek after the knowledge he had established," and how over time this knowledge has been lost, save for what remains in a very few books, which are difficult to understand, since the "ancients" sought to preserve the secrets "in order to confute fools in their evil intentions." Because this knowledge was "disguised," anyone seeking to "learn it must understand their maxims." Morienus begins to emphasize that the Work is but a single thing. This treatise is paradigmatic of the way in which validity and the authority of experience are bound up with each other in the alchemical tradition. Initially, Morienus is able to win the trust of the king solely on the basis of the answers he gives to questions concerning his personal experience during his first audience with the king. Later, Morienus tells the king that before he proceeds with instruction, he will perform various steps while the king watches, "so that you may see them", since "one who has seen this operation performed, is not as one who has sought for it only through books." White House - If you drive through the centre of the White House pentagram you come to a remarkable building at 1733 16th Street. Note the number: 1733. The number 17 recurs over and over in the story of Rennes-le-Chateau, and 33 is the official number of degrees in the Scottish Rite of Freemasonry. For similar facts about other numbers get the book Numbers: Facts, Figures and Fiction. Eat thou not the bread of him that hath an evil eye... the morsel which thou hast eaten shalt thou vomit up, and lose thy sweet words. Satan has so blatantly encoded his word into the health-food craze, revealing the terrible hoax in an obvious manner. Seek the message implicit in the words, O-A-T and B-R-A-N. Oat bran is certainly the greatest force in the popularization of health food. And strangely enough (or not) there is a hidden meaning. If one adds up the numeric values of the letters (A=1, B=2, C=3...Z=26), the message becomes clear. The number 36 stands for 3 sixes, or six squared is equal to 36. Either way, '666', the devil's mark is revealed. Oat Bran is Satan's Fiber! The Book of Revelation describes a Tree which has twelve manners of fruit. Only the zodiac has 12 fruits, such as were garnered by the 12 labours of Hercules. Each of the 12 signs has positive and negative qualities, so Revelation speaks of the 24 elders around the throne of God. In like manner each sign of the zodiac measures 30 degrees in extent, and has three decanates, each of ten degrees, thus making a total of 36 decanates in the circle of the zodiac. The Number of the Beast. If we take the number 36 and add each number from 1 to 36 the total is 666. We are here describing the qualities which are inherent in the degree positions of the circle. Helios the physical sun is equated with the number 666. The "magic square of the sun," was one of the most important symbols used to represent the sun in antiquity because of all the symbolism it possessed involving the perfect number "6." There are six sides to a cube, the numbers 1, 2, an 3, when added or multiplied together are equal to "6," and the sum of all the numbers from 1 to 36 arranged in a 6x6 magic square are equal to the number "666." The square is "magic" because the sum of any row, column, or diagonal is equal to the number "111." Since the early Christians were converted pagans, one of the ploys the early teachers of the church used to convert pagans to Christianity was that Jesus Christ had more solar attributes than any other god. Matthew 17:2 states that His face was even reputed to shine like the sun. Matt. 17:2 - And was transfigured before them; and his face did shine as the sun and his raiment was white as the light. The Greek alphabet has 26 letters, each one with a different numerical value. The Greek spelling of Jesus is IESOUS. The numerical value of IESOUS = 888 which represents The Spiritual Sun or Solar Logos. "In the beginning was the Logos" the Gospel of John states, and in the words of the Logos itself, "I am the Light of the World." All those who are born into the world is outwardly illuminated by the physical sun, but only those wh otrun their attention back to the world of first principles are inwardly enlightened by the Spiritual Sun of the Logos. The early Christians maintained that IESOUS was "a name above all names". Early Gnostic Christians were aware enough to make this comparisons. The raised Jesus (888) was known as the Spiritual Sun. In a dream I divined that that the three phases of the sun were fear, sharing, and love. At the present time, the space and time dynamics of the planetary heart are expanding. This expansion of Gaia's Heart is creating a situation where suddenly, as we move into the 21st century, there is more spiritual space in which to move. Relationships that have been stuck in positions of rigidity are now finding that new movements, and thus new relationships, are possible. The Immortalist Annalee Skarin has stated that more men and women shall emerge as High Priests and High Priestesses of Melchizedek during the next 30 to 40 years than ever before in the history of the planet. This is due to the expansion of the Gaian Heart which we are now experiencing. Paul, in the 8th chapter of Romans, has a profound Vision which describes the planetary Heart-Change which we are now in the midst of. He feels that all of creation is in the throes of Childbirth, waiting for the birth of the many Immortal Sons and Daughters of the Divine. For when these beings appear, then the entire universe shall be certain of Liberty - for the work of these Children of the Divine is to uplift all matter into frequencies above entropy, decay, and death. Paul was way ahead of his time in seeing the essential relationship between Gaia and individuals. The Heart-Womb of Gaia expands - and the Immortal Children of Global Regeneration emerge. Rene Guenon, in his book The Lord of the World, offers many valuable insights into the Melchizedek lineage. The name itself is originally spelled Melki-Tsedeq, which means the Tsaddik of Malkuth. In English, this is translated as the Just Adept of the Earth. The Tsaddik is one who has adjusted his or her Being to a point of perfect harmony while Living on the Earth. In the Hassidic tradition, there are always 36 Tsaddiks on the earth at all times. When the process of Tiqqun, or material ascension, is complete, then Messiah appears as the 37th Tsaddik. These 36 Tsaddiks are Perfect Heart-Masters, are physically Immortal, and are thus forever able to offer the Communion of the Grail. I would like to explain why there are traditionally 36 and to show their connections to the numbers 37 and 666. We often hear of 666 being the number of the Solar Logos and the ideal length of Glastonbury Abbey. These associations are all derived from the Hebrew Cabala. In the Cabalistic Tree of Life, spheres are traditionally numbered from the Crown Chakra-Kether downwards. The Heart chakra-Tiphareth is numbered 6 in this pattern. Each sphere has a magickal square. The square for Tiphareth-sun-Heart chakra is constructed by using its number 6: A square with 6 columns and 6 rows, or 6 × 6 = 36 sub-squares. Then the numbers 1 through 36 are placed in these 36 boxes so that each row or column adds up to 111. Thus the total value of the square of the sun is 666 - the Solar Logos. Six hundred sixty-six is 18 times 37. Thus the 36 Tsaddiks maintain the planetary grid which grounds the solar-666 force which is Christing Gaia. In Cabala, the term which describes the work of the Tsaddiks, Tiqqun, also has the value 666. Tiqqun means the translation of all matter into Union with the Immortal Frequencies of the Divine - this brings us back to our theme of Communion. For True Communion always has as its Divine Purpose the Total Transformation of Matter in a Way that Glorifies Aliveness, Liberty, Light & Love. This is forever the Work of the Heart Master. Each of the 36 Tsaddik Heart Masters is responsible for giving Immortal Grail Communion to 4000 individuals. This is how the number 144,000 is generated out of the Heart, for 36 × 4000 = 144,000. This number has been associated with the planetary changes initiated by Harmonic Convergence in August of 1987. To fulfill the prophecy of Annalee Skarin, we are now in the process of creating over a hundredfold increase in Immortals on the earth. At the present time the original 36 Heart Masters are focused in 12 groups of 3, each triune group acting as midwife at each of the 12 primary Gates of the New Jerusalem - 12 specific sacred sites which are giving birth to the New Aeon. One Child is emerging from 12 wombs... When this 12-womb birth is manifested and rooted, then the 36 Tsaddiks shift locations so that there is one Tsaddik at each of 36 distinct sacred sites. Within the next 30 to 40 years each Tsaddik shall have initiated a minimum of 4000 individuals into Mastery of the Way of Everlasting Life - Physical Immortality. The 144,000 are all now alive, incarnate. Rituals conducted in the Andes - at Lake Titicaca and Machu Picchu - on the Wesak Full Moon in May 1987 were specifically dedicated to Blessing the Birth of these 144,000. It should be noted that this number is a minimum figure - I am sure that many more than this shall find the Way of Immortal Communion before we advance to the mid-point of the 21st Century. In this vision of earth evolution, Tsaddiks may be interpreted as initiatory spirits of location, or as individual beings working in conjunction with the Gaian Will. The archetypes of Planetary Surrealism may be interpreted in many ways...Always remember that this work is Creative and Artistic. In a word, the 1997 Hollywood film Men in Black is the unmodified, though modernized, retelling of an ancient Jewish legend called the "36 Righteous Men!" Before the story itself, let's look at the source of the legend - the Midrash. Midrash is a Jewish term from the Hebrew verb darash that means, "to search" and, therefore, to make exposition. It is the title of a body of Jewish literature used in the centuries just before and after Jesus, that was designed to reveal an interpretation of the Scriptures that was not apparent on the surface. It is a running commentary by various scholars on Biblical texts. It refers to both a method of interpretation and a body of literature. There is not one book called the Midrash, but rather many anthologies of Midrashim compiled between the 2nd and 14th centuries CE. The collections of Midrashim fall into two broad categories, Midrash Halacha (Jewish law) and Midrash Aggada (legends). In Midrash Halacha, the main focus is on the legal sections of Torah. The main anthologies in this category are Mechilta (Collection) on Exodus; Sifra (Book) on Leviticus; and Sifrei (Books) on Numbers and Deuteronomy. These became the basis of later legal literature, the Mishnah and both Talmuds. Midrash Aggada is what most people think of when using the term Midrash. This kind of Midrash deals with mostly non-legal issues, including "filling in the blanks" in the narrative, philosophy, ethics . . . and legends. And from the Midrash Agadda comes the story of the 36 Hidden Saints. In Hebrew, the 36 Righteous Men are called the Lamed Vav Zaddikim. Lamed and vav are the third and sixth letters of the Hebrew alphabet respectively, and form the number "36." It is possible that the number 36 derives from Jewish (and ancient Babylonian) astrology. It is believed that there are 36 celestial deacons, each of which rules ten days of the year. Thus we have the ten degrees of each constellation. A Zaddik (also transliterated Tzadik or Tsadik) is a holy man, though not necessarily directly associated with religion. He can be anyone. Since the story is also known in Yiddish, the language of the Chassidic Jew, we can assume that the 36 Hidden Saints, like the Chassids who told the story, wore black. Thus, the Lamed Vav Zaddikim are the original Men in Black. As you can see, the major change from the legend of the Lamed Vav Zaddikim to Men in Black is minuscule - the change in the number of the hidden saints. However, even here there is a very strong link. The number of MiBs must be 26 because each is named after a letter of the alphabet. Certainly 26 is a clear echo of 36! And moving from a celestial numerological source to a literary numerological source seems a reasonable step both for a film and for a twentieth-century transformation of a legend. The transformation of the numerology is itself interesting. Hebrew uses the alphabet for both characters and numerals (as do most languages around the world). In English, we use the Arabic alphabet for our numerals, hence "Arabic Numerals." Thus, the modernization of the story has actually made a retrograde contribution to alphabetic numerology: it treats the English alphabet as if it were composed of numbers, i.e., 26 letters of the alphabet now become the number of the Zaddikim. If we were to pursue this into the intricacies of the Kabbala (the Jewish mystical studies that include alchemy and numerology), we could easily note that in modernizing the older myth to make it more palatable to contemporary political and gender sensibilities, the authors have introduced an African-American character who, in turn, brings a woman into the story. The mathematical difference between the old and the new stories is 10 (36 - 26 = 10) and the character who causes the increase by subtraction is himself "10," for "J" is the tenth letter of the English alphabet. Once all these connections are pointed out, there is little left to say about the movie. If the story was composed by the screenwriters naively, then Carl Jung (with his idea of a Collective Unconscious which contains archetypal figures that are expressed in the physical world in the forms of the stories we tell [and live by]), on the evidence in this movie, should be posthumously awarded the Nobel Prize and the McArthur Award all rolled into one. If the screenwriters did this consciously, then my hat is off to some very clever and psychologically perceptive writers. In either case, Men in Black may be the first totally Jewish movie that has not a single obvious Jew in it. In some ways, the film even corrects its sources. Jewish legends are notoriously sexist (though there are a surprisingly large number about heroic, active and competent women). In particular, this is the legend of the 36 men who save the world. At the end of Men in Black, a woman is inducted as an equal. In this way the film expands the ancient legend into our twentieth century sensibilities - now women can participate equally in the saving of the world. As an additional note, I would like to point out that the story is embellished with other references, primarily to Franz Kafka. Agents J and K seem to be references to "Joseph K.," the protagonist of "The Trial" (1925). In addition, the idea of giant cockroach as nemesis, especially one disguised as a human, is a clear reference to "Metamorphosis" (1915). In general, Kafka's works are recognized as symbolizing modern man's anxiety-ridden and grotesque alienation in an unintelligible, hostile, or indifferent world. And this too is echoed in this film's paranoia about the Earth having been invaded long ago by potentially dangerous aliens who look just like us. Furthermore, Kafka's style forms a striking contrast to the labyrinthine complexities, the anxiety-laden absurdities, and the powerfully oppressive symbols of torment and anomie. Most popular critics agree with Roger Ebert that "wicked little side jokes like that are the heart and soul of Men in Black." And certainly seeing Sylvester Stallone, Newt Gingrich, Dionne Warwick, Dennis Rodman and Elvis ("he didn't die, he just went home") as aliens is fun. But these mainstream critics have all missed the point by ignoring the archetypal nature of films, especially Men in Black. Well, between ancient Jewish legends and Franz Kafka, Men in Black is certainly more than the usual Hollywood summer entertainment. What I find fascinating about the film is that it proves (once again) that depth and intelligence, mythic basis and psychological insight do not preclude popularity. In fact, when done with sufficient wit, they guarantee it. And, it's good to know that someone out there is taking care of us. Originally published in "The Hi-Q Film Review." Subscription information is available from Hiqrevu@aol.com. The number of 36 was the highest oath for the Pythagorean. They are captivated by the following mathematical properties of this number: 36 = 1+2+3+4+5+6+7+8 = (1+3+5+7) + (2+4+6+8). As the number of 36 is formed as the sum of the first four odd numbers and the first four even numbers Pythagorean made conclusion that 36 is a symbol of the world. 1. Are we to think that a being knowing itself must contain diversity, that self-knowledge can be affirmed only when some one phase of the self perceives other phases, and that therefore an absolutely simplex entity would be equally incapable of introversion and of self-awareness? No: a being that has no parts or phases may have this consciousness; in fact there would be no real self-knowing in an entity presented as knowing itself in virtue of being a compound- some single element in it perceiving other elements- as we may know our own form and entire bodily organism by sense-perception: such knowing does not cover the whole field; the knowing element has not had the required cognisance at once of its associates and of itself; this is not the self-knower asked for; it is merely something that knows something else. Either we must exhibit the self-knowing of an uncompounded being- and show how that is possible- or abandon the belief that any being can possess veritable self-cognition. To abandon the belief is not possible in view of the many absurdities thus entailed. It would be already absurd enough to deny this power to the soul or mind, but the very height of absurdity to deny it to the nature of the Intellectual-Principle, presented thus as knowing the rest of things but not attaining to knowledge, or even awareness, of itself. It is the province of sense and in some degree of understanding and judgement, but not of the Intellectual-Principle, to handle the external, though whether the Intellectual-Principle holds the knowledge of these things is a question to be examined, but it is obvious that the Intellectual-Principle must have knowledge of the Intellectual objects. Now, can it know those objects alone or must it not simultaneously know itself, the being whose function it is to know just those things? Can it have self-knowledge in the sense [dismissed above as inadequate] of knowing its content while it ignores itself? Can it be aware of knowing its members and yet remain in ignorance of its own knowing self? Self and content must be simultaneously present: the method and degree of this knowledge we must now consider. 2. We begin with the soul, asking whether it is to be allowed self-knowledge and what the knowing principle in it would be and how operating. The sense-principle in it we may at once decide, takes cognisance only of the external; even in any awareness of events within the body it occupies, this is still the perception of something external to a principle dealing with those bodily conditions not as within but as beneath itself. The reasoning-principle in the Soul acts upon the representations standing before it as the result of sense-perception; these it judges, combining, distinguishing: or it may also observe the impressions, so to speak, rising from the Intellectual-Principle, and has the same power of handling these; and reasoning will develop to wisdom where it recognizes the new and late-coming impressions [those of sense] and adapts them, so to speak, to those it holds from long before- the act which may be described as the soul's Reminiscence. So far as this, the efficacy of the Intellectual-Principle in the Soul certainly reaches; but is there also introversion and self-cognition or is that power to be reserved strictly for the Divine Mind? If we accord self-knowing to this phase of the soul we make it an Intellectual-Principle and will have to show what distinguishes it from its prior; if we refuse it self-knowing, all our thought brings us step by step to some principle which has this power, and we must discover what such self-knowing consists in. If, again, we do allow self-knowledge in the lower we must examine the question of degree; for if there is no difference of degree, then the reasoning principle in soul is the Intellectual-Principle unalloyed. We ask, then, whether the understanding principle in the soul has equally the power of turning inwards upon itself or whether it has no more than that of comprehending the impressions, superior and inferior, which it receives. The first stage is to discover what this comprehension is. 3. Sense sees a man and transmits the impression to the understanding. What does the understanding say? It has nothing to say as yet; it accepts and waits; unless, rather, it questions within itself "Who is this? "- someone it has met before- and then, drawing on memory, says, "Socrates." If it should go on to develop the impression received, it distinguishes various elements in what the representative faculty has set before it; supposing it to say "Socrates, if the man is good," then, while it has spoken upon information from the senses, its total pronouncement is its own; it contains within itself a standard of good. But how does it thus contain the good within itself? It is, itself, of the nature of the good and it has been strengthened still towards the perception of all that is good by the irradiation of the Intellectual-Principle upon it; for this pure phase of the soul welcomes to itself the images implanted from its prior. But why may we not distinguish this understanding phase as Intellectual-Principle and take soul to consist of the later phases from the sensitive downwards? Because all the activities mentioned are within the scope of a reasoning faculty, and reasoning is characteristically the function of soul. Why not, however, absolve the question by assigning self-cognisance to this phase? Because we have allotted to soul the function of dealing- in thought and in multiform action- with the external, and we hold that observation of self and of the content of self must belong to Intellectual-Principle. If any one says, "Still; what precludes the reasoning soul from observing its own content by some special faculty?" he is no longer posting a principle of understanding or of reasoning but, simply, bringing in the Intellectual-Principle unalloyed. But what precludes the Intellectual-Principle from being present, unalloyed, within the soul? Nothing, we admit; but are we entitled therefore to think of it as a phase of soul? We cannot describe it as belonging to the soul though we do describe it as our Intellectual-Principle, something distinct from the understanding, advanced above it, and yet ours even though we cannot include it among soul-phases: it is ours and not ours; and therefore we use it sometimes and sometimes not, whereas we always have use of the understanding; the Intellectual-Principle is ours when we act by it, not ours when we neglect it. But what is this acting by it? Does it mean that we become the Intellectual-Principle so that our utterance is the utterance of the Intellectual-Principle, or that we represent it? We are not the Intellectual-Principle; we represent it in virtue of that highest reasoning faculty which draws upon it. Still; we perceive by means of the perceptive faculty and are, ourselves, the percipients: may we not say the same of the intellective act? No: our reasoning is our own; we ourselves think the thoughts that occupy the understanding- for this is actually the We- but the operation of the Intellectual-Principle enters from above us as that of the sensitive faculty from below; the We is the soul at its highest, the mid-point between two powers, between the sensitive principle, inferior to us, and the intellectual principle superior. We think of the perceptive act as integral to ourselves because our sense-perception is uninterrupted; we hesitate as to the Intellectual-Principle both because we are not always occupied with it and because it exists apart, not a principle inclining to us but one to which we incline when we choose to look upwards. The sensitive principle is our scout; the Intellectual-Principle our King. 4. But we, too, are king when we are moulded to the Intellectual-Principle. That correspondence may be brought about in two ways: either the radii from that centre are traced upon us to be our law or we are filled full of the Divine Mind, which again may have become to us a thing seen and felt as a presence. Hence our self-knowing comes to the knowing of all the rest of our being in virtue of this thing patently present; or by that power itself communicating to us its own power of self-knowing; or by our becoming identical with that principle of knowledge. Thus the self-knower is a double person: there is the one that takes cognisance of the principle in virtue of which understanding occurs in the soul or mind; and there is the higher, knowing himself by the Intellectual-Principle with which he becomes identical: this latter knows the self as no longer man but as a being that has become something other through and through: he has thrown himself as one thing over into the superior order, taking with him only that better part of the soul which alone is winged for the Intellectual Act and gives the man, once established There, the power to appropriate what he has seen. We can scarcely suppose this understanding faculty to be unaware that it has understanding; that it takes cognisance of things external; that in its judgements it decides by the rules and standards within itself held directly from the Intellectual-Principle; that there is something higher than itself, something which, moreover, it has no need to seek but fully possesses. What can we conceive to escape the self-knowledge of a principle which admittedly knows the place it holds and the work it has to do? It affirms that it springs from Intellectual-Principle whose second and image it is, that it holds all within itself, the universe of things, engraved, so to say, upon it as all is held There by the eternal engraver. Aware so far of itself, can it be supposed to halt at that? Are we to suppose that all we can do is to apply a distinct power of our nature and come thus to awareness of that Intellectual-Principle as aware of itself? Or may we not appropriate that principle- which belongs to us as we to it- and thus attain to awareness, at once, of it and of ourselves? Yes: this is the necessary way if we are to experience the self-knowledge vested in the Intellectual-Principle. And a man becomes Intellectual-Principle when, ignoring all other phases of his being, he sees through that only and sees only that and so knows himself by means of the self- in other words attains the self-knowledge which the Intellectual-Principle possesses. 5. Does it all come down, then, to one phase of the self knowing another phase? That would be a case of knower distinguished from known, and would not be self-knowing. What, then, if the total combination were supposed to be of one piece, knower quite undistinguished from known, so that, seeing any given part of itself as identical with itself, it sees itself by means of itself, knower and known thus being entirely without differentiation? To begin with, the distinction in one self thus suggested is a strange phenomenon. How is the self to make the partition? The thing cannot happen of itself. And, again, which phase makes it? The phase that decides to be the knower or that which is to be the known? Then how can the knowing phase know itself in the known when it has chosen to be the knower and put itself apart from the known? In such self-knowledge by sundering it can be aware only of the object, not of the agent; it will not know its entire content, or itself as an integral whole; it knows the phase seen but not the seeing phase and thus has knowledge of something else, not self-knowledge. In order to perfect self-knowing it must bring over from itself the knowing phase as well: seeing subject and seen objects must be present as one thing. Now if in this coalescence of seeing subject with seen objects, the objects were merely representations of the reality, the subject would not possess the realities: if it is to possess them it must do so not by seeing them as the result of any self-division but by knowing them, containing them, before any self-division occurs. At that, the object known must be identical with the knowing act [or agent], the Intellectual-Principle, therefore, identical with the Intellectual Realm. And in fact, if this identity does not exist, neither does truth; the Principle that should contain realities is found to contain a transcript, something different from the realities; that constitutes non-Truth; Truth cannot apply to something conflicting with itself; what it affirms it must also be. Thus we find that the Intellectual-Principle, the Intellectual Realm and Real Being constitute one thing, which is the Primal Being; the primal Intellectual-Principle is that which contains the realities or, rather, which is identical with them. But taking Primal Intellection and its intellectual object to be a unity, how does that give an Intellective Being knowing itself? An intellection enveloping its object or identical with it is far from exhibiting the Intellectual-Principle as self-knowing. All turns on the identity. The intellectual object is itself an activity, not a mere potentiality; it is not lifeless; nor are the life and intellection brought into it as into something naturally devoid of them, some stone or other dead matter; no, the intellectual object is essentially existent, the primal reality. As an active force, the first activity, it must be, also itself, the noblest intellection, intellection possessing real being since it is entirely true; and such an intellection, primal and primally existent, can be no other than the primal principle of Intellection: for that primal principle is no potentiality and cannot be an agent distinct from its act and thus, once more, possessing its essential being as a mere potentiality. As an act- and one whose very being is an act- it must be undistinguishably identical with its act: but Being and the Intellectual object are also identical with that act; therefore the Intellectual-Principle, its exercise of intellection and the object of intellection all are identical. Given its intellection identical with intellectual object and the object identical with the Principle itself, it cannot but have self-knowledge: its intellection operates by the intellectual act which is itself upon the intellectual object which similarly is itself. It possesses self-knowing, thus, on every count; the act is itself; and the object seen in that act- self, is itself. 6. Thus we have shown that there exists that which in the strictest sense possesses self-knowing. This self-knowing agent, perfect in the Intellectual-Principle, is modified in the Soul. The difference is that, while the soul knows itself as within something else, the Intellectual-Principle knows itself as self-depending, knows all its nature and character, and knows by right of its own being and by simple introversion. When it looks upon the authentic existences it is looking upon itself; its vision as its effective existence, and this efficacy is itself since the Intellectual-Principle and the Intellectual Act are one: this is an integral seeing itself by its entire being, not a part seeing by a part. But has our discussion issued in an Intellectual-Principle having a persuasive activity [furnishing us with probability]? No: it brings compulsion not persuasion; compulsion belongs to the Intellectual-Principle, persuasion to the soul or mind, and we seem to desire to be persuaded rather than to see the truth in the pure intellect. As long as we were Above, collected within the Intellectual nature, we were satisfied; we were held in the intellectual act; we had vision because we drew all into unity- for the thinker in us was the Intellectual-Principle telling us of itself- and the soul or mind was motionless, assenting to that act of its prior. But now that we are once more here- living in the secondary, the soul- we seek for persuasive probabilities: it is through the image we desire to know the archetype. Our way is to teach our soul how the Intellectual-Principle exercises self-vision; the phase thus to be taught is that which already touches the intellective order, that which we call the understanding or intelligent soul, indicating by the very name that it is already of itself in some degree an Intellectual-Principle or that it holds its peculiar power through and from that Principle. This phase must be brought to understand by what means it has knowledge of the thing it sees and warrant for what it affirms: if it became what it affirms, it would by that fact possess self-knowing. All its vision and affirmation being in the Supreme or deriving from it- There where itself also is- it will possess self-knowledge by its right as a Reason-Principle, claiming its kin and bringing all into accord with the divine imprint upon it. The soul therefore [to attain self-knowledge] has only to set this image [that is to say, its highest phase] alongside the veritable Intellectual-Principle which we have found to be identical with the truths constituting the objects of intellection, the world of Primals and Reality: for this Intellectual-Principle, by very definition, cannot be outside of itself, the Intellectual Reality: self-gathered and unalloyed, it is Intellectual-Principle through all the range of its being- for unintelligent intelligence is not possible- and thus it possesses of necessity self-knowing, as a being immanent to itself and one having for function and essence to be purely and solely Intellectual-Principle. This is no doer; the doer, not self-intent but looking outward, will have knowledge, in some kind, of the external, but, if wholly of this practical order, need have no self-knowledge; where, on the contrary, there is no action- and of course the pure Intellectual-Principle cannot be straining after any absent good- the intention can be only towards the self; at once self-knowing becomes not merely plausible but inevitable; what else could living signify in a being immune from action and existing in Intellect? 7. The contemplating of God, we might answer. But to admit its knowing God is to be compelled to admit its self-knowing. It will know what it holds from God, what God has given forth or may; with this knowledge, it knows itself at the stroke, for it is itself one of those given things- in fact is all of them. Knowing God and His power, then, it knows itself, since it comes from Him and carries His power upon it; if, because here the act of vision is identical with the object, it is unable to see God clearly, then all the more, by the equation of seeing and seen, we are driven back upon that self-seeing and self-knowing in which seeing and thing seen are undistinguishably one thing. And what else is there to attribute to it? Repose, no doubt; but, to an Intellectual-Principle, Repose is not an abdication from intellect; its Repose is an Act, the act of abstention from the alien: in all forms of existence repose from the alien leaves the characteristic activity intact, especially where the Being is not merely potential but fully realized. In the Intellectual-Principle, the Being is an Act and in the absence of any other object it must be self-directed; by this self-intellection it holds its Act within itself and upon itself; all that can emanate from it is produced by this self-centering and self-intention; first- self-gathered, it then gives itself or gives something in its likeness; fire must first be self-centred and be fire, true to fire's natural Act; then it may reproduce itself elsewhere. Once more, then; the Intellectual-Principle is a self-intent activity, but soul has the double phase, one inner, intent upon the Intellectual-Principle, the other outside it and facing to the external; by the one it holds the likeness to its source; by the other, even in its unlikeness, it still comes to likeness in this sphere, too, by virtue of action and production; in its action it still contemplates, and its production produces Ideal-forms- divine intellections perfectly wrought out- so that all its creations are representations of the divine Intellection and of the divine Intellect, moulded upon the archetype, of which all are emanations and images, the nearer more true, the very latest preserving some faint likeness of the source. 8. Now comes the question what sort of thing does the Intellectual-Principle see in seeing the Intellectual Realm and what in seeing itself? We are not to look for an Intellectual realm reminding us of the colour or shape to be seen on material objects: the intellectual antedates all such things; and even in our sphere the production is very different from the Reason-Principle in the seeds from which it is produced. The seed principles are invisible and the beings of the Intellectual still more characteristically so; the Intellectuals are of one same nature with the Intellectual Realm which contains them, just as the Reason-Principle in the seed is identical with the soul, or life-principle, containing it. But the Soul (considered as apart from the Intellectual-Principle) has no vision of what it thus contains, for it is not the producer but, like the Reason-Principles also, an image of its source: that source is the brilliant, the authentic, the primarily existent, the thing self-sprung and self-intent; but its image, soul, is a thing which can have no permanence except by attachment, by living in that other; the very nature of an image is that, as a secondary, it shall have its being in something else, if at all it exist apart from its original. Hence this image (soul) has not vision, for it has not the necessary light, and, if it should see, then, as finding its completion elsewhere, it sees another, not itself. In the pure Intellectual there is nothing of this: the vision and the envisioned are a unity; the seen is as the seeing and seeing as seen. What, then, is there that can pronounce upon the nature of this all-unity? That which sees: and to see is the function of the Intellectual-Principle. Even in our own sphere [we have a parallel to this self-vision of a unity], our vision is light or rather becomes one with light, and it sees light for it sees colours. In the intellectual, the vision sees not through some medium but by and through itself alone, for its object is not external: by one light it sees another not through any intermediate agency; a light sees a light, that is to say a thing sees itself. This light shining within the soul enlightens it; that is, it makes the soul intellective, working it into likeness with itself, the light above. Think of the traces of this light upon the soul, then say to yourself that such, and more beautiful and broader and more radiant, is the light itself; thus you will approach to the nature of the Intellectual-Principle and the Intellectual Realm, for it is this light, itself lit from above, which gives the soul its brighter life. It is not the source of the generative life of the soul which, on the contrary, it draws inward, preserving it from such diffusion, holding it to the love of the splendour of its Prior. Nor does it give the life of perception and sensation, for that looks to the external and to what acts most vigorously upon the senses whereas one accepting that light of truth may be said no longer to see the visible, but the very contrary. This means in sum that the life the soul takes thence is an intellective life, a trace of the life in the [divine] Intellect, in which alone the authentic exists. The life in the Divine Intellect is also an Act: it is the primal light outlamping to itself primarily, its own torch; light-giver and lit at once; the authentic intellectual object, knowing at once and known, seen to itself and needing no other than itself to see by, self-sufficing to the vision, since what it sees it is; known to us by that very same light, our knowledge of it attained through itself, for from nowhere else could we find the means of telling of it. By its nature, its self-vision is the clearer but, using it as our medium, we too may come to see by it. In the strength of such considerations we lead up our own soul to the Divine, so that it poses itself as an image of that Being, its life becoming an imprint and a likeness of the Highest, its every act of thought making it over into the Divine and the Intellectual. If the soul is questioned as to the nature of that Intellectual-Principle- the perfect and all-embracing, the primal self-knower- it has but to enter into that Principle, or to sink all its activity into that, and at once it shows itself to be in effective possession of those priors whose memory it never lost: thus, as an image of the Intellectual-Principle, it can make itself the medium by which to attain some vision of it; it draws upon that within itself which is most closely resemblant, as far as resemblance is possible between divine Intellect and any phase of soul. 9. In order, then, to know what the Divine Mind is, we must observe soul and especially its most God-like phase. One certain way to this knowledge is to separate first, the man from the body- yourself, that is, from your body- next to put aside that soul which moulded the body, and, very earnestly, the system of sense with desires and impulses and every such futility, all setting definitely towards the mortal: what is left is the phase of the soul which we have declared to be an image of the Divine Intellect, retaining some light from that sun, while it pours downward upon the sphere of magnitudes [that is, of Matter] the light playing about itself which is generated from its own nature. Of course we do not pretend that the sun's light [as the analogy might imply] remains a self-gathered and sun-centred thing: it is at once outrushing and indwelling; it strikes outward continuously, lap after lap, until it reaches us upon our earth: we must take it that all the light, including that which plays about the sun's orb, has travelled; otherwise we would have a void expanse, that of the space- which is material- next to the sun's orb. The Soul, on the contrary- a light springing from the Divine Mind and shining about it- is in closest touch with that source; it is not in transit but remains centred there, and, in likeness to that principle, it has no place: the light of the sun is actually in the air, but the soul is clean of all such contact so that its immunity is patent to itself and to any other of the same order. And by its own characteristic act, though not without reasoning process, it knows the nature of the Intellectual-Principle which, on its side, knows itself without need of reasoning, for it is ever self-present whereas we become so by directing our soul towards it; our life is broken and there are many lives, but that principle needs no changings of life or of things; the lives it brings to being are for others not for itself: it cannot need the inferior; nor does it for itself produce the less when it possesses or is the all, nor the images when it possesses or is the prototype. Anyone not of the strength to lay hold of the first soul, that possessing pure intellection, must grasp that which has to do with our ordinary thinking and thence ascend: if even this prove too hard, let him turn to account the sensitive phase which carries the ideal forms of the less fine degree, that phase which, too, with its powers, is immaterial and lies just within the realm of Ideal-principles. One may even, if it seem necessary, begin as low as the reproductive soul and its very production and thence make the ascent, mounting from those ultimate ideal principles to the ultimates in the higher sense, that is to the primals. 10. This matter need not be elaborated at present: it suffices to say that if the created were all, these ultimates [the higher] need not exist: but the Supreme does include primals, the primals because the producers. In other words, there must be, with the made, the making source; and, unless these are to be identical, there will be need of some link between them. Similarly, this link which is the Intellectual-Principle demands yet a Transcendent. If we are asked why this Transcendent also should not have self-vision, our answer is that it has no need of vision; but this we will discuss later: for the moment we go back, since the question at issue is gravely important. We repeat that the Intellectual-Principle must have, actually has, self-vision, firstly because it has multiplicity, next because it exists for the external and therefore must be a seeing power, one seeing that external; in fact its very essence is vision. Given some external, there must be vision; and if there be nothing external the Intellectual-Principle [Divine Mind] exists in vain. Unless there is something beyond bare unity, there can be no vision: vision must converge with a visible object. And this which the seer is to see can be only a multiple, no undistinguishable unity; nor could a universal unity find anything upon which to exercise any act; all, one and desolate, would be utter stagnation; in so far as there is action, there is diversity. If there be no distinctions, what is there to do, what direction in which to move? An agent must either act upon the extern or be a multiple and so able to act upon itself: making no advance towards anything other than itself, it is motionless and where it could know only blank fixity it can know nothing. The intellective power, therefore, when occupied with the intellectual act, must be in a state of duality, whether one of the two elements stand actually outside or both lie within: the intellectual act will always comport diversity as well as the necessary identity, and in the same way its characteristic objects [the Ideas] must stand to the Intellectual-Principle as at once distinct and identical. This applies equally to the single object; there can be no intellection except of something containing separable detail and, since the object is a Reason-principle [a discriminated Idea] it has the necessary element of multiplicity. The Intellectual-Principle, thus, is informed of itself by the fact of being a multiple organ of vision, an eye receptive of many illuminated objects. If it had to direct itself to a memberless unity, it would be dereasoned: what could it say or know of such an object? The self-affirmation of [even] a memberless unity implies the repudiation of all that does not enter into the character: in other words, it must be multiple as a preliminary to being itself. Then, again, in the assertion "I am this particular thing," either the "particular thing" is distinct from the assertor- and there is a false statement- or it is included within it, and, at once, multiplicity is asserted: otherwise the assertion is "I am what I am," or "I am I." If it be no more than a simple duality able to say "I and that other phase," there is already multiplicity, for there is distinction and ground of distinction, there is number with all its train of separate things. In sum, then, a knowing principle must handle distinct items: its object must, at the moment of cognition, contain diversity; otherwise the thing remains unknown; there is mere conjunction, such a contact, without affirmation or comprehension, as would precede knowledge, the intellect not yet in being, the impinging agent not percipient. Similarly the knowing principle itself cannot remain simplex, especially in the act of self-knowing: all silent though its self-perception be, it is dual to itself. Of course it has no need of minute self-handling since it has nothing to learn by its intellective act; before it is [effectively] Intellect, it holds knowledge of its own content. Knowledge implies desire, for it is, so to speak, discovery crowning a search; the utterly undifferentiated remains self-centred and makes no enquiry about that self: anything capable of analysing its content, must be a manifold. 11. Thus the Intellectual-Principle, in the act of knowing the Transcendent, is a manifold. It knows the Transcendent in very essence but, with all its effort to grasp that prior as a pure unity, it goes forth amassing successive impressions, so that, to it, the object becomes multiple: thus in its outgoing to its object it is not [fully realised] Intellectual-Principle; it is an eye that has not yet seen; in its return is an eye possessed of the multiplicity which it has itself conferred: it sought something of which it found the vague presentment within itself; it returned with something else, the manifold quality with which it has of its own act invested the simplex. If it had not possessed a previous impression of the Transcendent, it could never have grasped it, but this impression, originally of unity, becomes an impression of multiplicity; and the Intellectual-Principle, in taking cognisance of that multiplicity, knows the Transcendent and so is realized as an eye possessed of its vision. It is now Intellectual-Principle since it actually holds its object, and holds it by the act of intellection: before, it was no more than a tendance, an eye blank of impression: it was in motion towards the transcendental; now that it has attained, it has become Intellectual-Principle henceforth absorbed; in virtue of this intellection it holds the character of Intellectual-Principle, of Essential Existence and of Intellectual Act where, previously, not possessing the Intellectual Object, it was not Intellectual Perception, and, not yet having exercised the Intellectual Act, it was not Intellectual-Principle. The Principle before all these principles is no doubt the first principle of the universe, but not as immanent: immanence is not for primal sources but for engendering secondaries; that which stands as primal source of everything is not a thing but is distinct from all things: it is not, then, a member of the total but earlier than all, earlier, thus, than the Intellectual-Principle- which in fact envelops the entire train of things. Thus we come, once more, to a Being above the Intellectual-Principle and, since the sequent amounts to no less than the All, we recognise, again, a Being above the All. This assuredly cannot be one of the things to which it is prior. We may not call it "Intellect"; therefore, too, we may not call it "the Good," if "the Good" is to be taken in the sense of some one member of the universe; if we mean that which precedes the universe of things, the name may be allowed. The Intellectual-Principle is established in multiplicity; its intellection, self-sprung though it be, is in the nature of something added to it [some accidental dualism] and makes it multiple: the utterly simplex, and therefore first of all beings, must, then, transcend the Intellectual-Principle; and, obviously, if this had intellection it would no longer transcend the Intellectual-Principle but be it, and at once be a multiple. 12. But why, after all, should it not be such a manifold as long as it remains one substantial existence, having the multiplicity not of a compound being but of a unity with a variety of activities? Now, no doubt, if these various activities are not themselves substantial existences- but merely manifestations of latent potentiality- there is no compound; but, on the other hand, it remains incomplete until its substantial existence be expressed in act. If its substantial existence consists in its Act, and this Act constitutes multiplicity, then its substantial existence will be strictly proportioned to the extent of the multiplicity. We allow this to be true for the Intellectual-Principle to which we have allotted [the multiplicity of] self-knowing; but for the first principle of all, never. Before the manifold, there must be The One, that from which the manifold rises: in all numerical series, the unit is the first. But- we will be answered- for number, well and good, since the suite makes a compound; but in the real beings why must there be a unit from which the multiplicity of entities shall proceed? Because [failing such a unity] the multiplicity would consist of disjointed items, each starting at its own distinct place and moving accidentally to serve to a total. But, they will tell us, the Activities in question do proceed from a unity, from the Intellectual-Principle, a simplex. By that they admit the existence of a simplex prior to the Activities; and they make the Activities perdurable and class them as substantial existences [hypostases]; but as Hypostases they will be distinct from their source, which will remain simplex; while its product will in its own nature be manifold and dependent upon it. Now if these activities arise from some unexplained first activity in that principle, then it too contains the manifold: if, on the contrary, they are the very earliest activities and the source and cause of any multiple product and the means by which that Principle is able, before any activity occurs, to remain self-centred, then they are allocated to the product of which they are the cause; for this principle is one thing, the activities going forth from it are another, since it is not, itself, in act. If this be not so, the first act cannot be the Intellectual-Principle: the One does not provide for the existence of an Intellectual-Principle which thereupon appears; that provision would be something [an Hypostasis] intervening between the One and the Intellectual-Principle, its offspring. There could, in fact, be no such providing in The One, for it was never incomplete; and such provision could name nothing that ought to be provided. It cannot be thought to possess only some part of its content, and not the whole; nor did anything exist to which it could turn in desire. Clearly anything that comes into being after it, arises without shaking to its permanence in its own habit. It is essential to the existence of any new entity that the First remain in self-gathered repose throughout: otherwise, it moved before there was motion and had intellectual act before any intellection- unless, indeed, that first act [as motionless and without intelligence] was incomplete, nothing more than a tendency. And what can we imagine it lights upon to become the object of such a tendency? The only reasonable explanation of act flowing from it lies in the analogy of light from a sun. The entire intellectual order may be figured as a kind of light with the One in repose at its summit as its King: but this manifestation is not cast out from it: we may think, rather, of the One as a light before the light, an eternal irradiation resting upon the Intellectual Realm; this, not identical with its source, is yet not severed from it nor of so remote a nature as to be less than Real-Being; it is no blind thing, but is seeing and knowing, the primal knower. The One, as transcending Intellect, transcends knowing: above all need, it is above the need of the knowing which pertains solely to the Secondary Nature. Knowing is a unitary thing, but defined: the first is One, but undefined: a defined One would not be the One-absolute: the absolute is prior to the definite. 13. Thus The One is in truth beyond all statement: any affirmation is of a thing; but the all-transcending, resting above even the most august divine Mind, possesses alone of all true being, and is not a thing among things; we can give it no name because that would imply predication: we can but try to indicate, in our own feeble way, something concerning it: when in our perplexity we object, "Then it is without self-perception, without self-consciousness, ignorant of itself"; we must remember that we have been considering it only in its opposites. If we make it knowable, an object of affirmation, we make it a manifold; and if we allow intellection in it we make it at that point indigent: supposing that in fact intellection accompanies it, intellection by it must be superfluous. Self-intellection- which is the truest- implies the entire perception of a total self formed from a variety converging into an integral; but the Transcendent knows neither separation of part nor any such enquiry; if its intellectual act were directed upon something outside, then, the Transcendent would be deficient and the intellection faulty. The wholly simplex and veritable self-sufficing can be lacking at no point: self-intellection begins in that principle which, secondarily self-sufficing, yet needs itself and therefore needs to know itself: this principle, by its self-presence, achieves its sufficiency in virtue of its entire content [it is the all]: it becomes thus competent from the total of its being, in the act of living towards itself and looking upon itself. Consciousness, as the very word indicates, is a conperception, an act exercised upon a manifold: and even intellection, earlier [nearer to the divine] though it is, implies that the agent turns back upon itself, upon a manifold, then. If that agent says no more than "I am a being," it speaks [by the implied dualism] as a discoverer of the extern; and rightly so, for being is a manifold; when it faces towards the unmanifold and says, "I am that being," it misses both itself and the being [since the simplex cannot be thus divided into knower and known]: if it is [to utter] truth it cannot indicate by "being" something like a stone; in the one phrase multiplicity is asserted; for the being thus affirmed- [even] the veritable, as distinguished from such a mere container of some trace of being as ought not to be called a being since it stands merely as image to archetype- even this must possess multiplicity. But will not each item in that multiplicity be an object of intellection to us? Taken bare and single, no: but Being itself is manifold within itself, and whatever else you may name has Being. This accepted, it follows that anything that is to be thought of as the most utterly simplex of all cannot have self-intellection; to have that would mean being multiple. The Transcendent, thus, neither knows itself nor is known in itself. 14. How, then, do we ourselves come to be speaking of it? No doubt we deal with it, but we do not state it; we have neither knowledge nor intellection of it. But in what sense do we even deal with it when we have no hold upon it? We do not, it is true, grasp it by knowledge, but that does not mean that we are utterly void of it; we hold it not so as to state it, but so as to be able to speak about it. And we can and do state what it is not, while we are silent as to what it is: we are, in fact, speaking of it in the light of its sequels; unable to state it, we may still possess it. Those divinely possessed and inspired have at least the knowledge that they hold some greater thing within them though they cannot tell what it is; from the movements that stir them and the utterances that come from them they perceive the power, not themselves, that moves them: in the same way, it must be, we stand towards the Supreme when we hold the Intellectual-Principle pure; we know the divine Mind within, that which gives Being and all else of that order: but we know, too, that other, know that it is none of these, but a nobler principle than any-thing we know as Being; fuller and greater; above reason, mind and feeling; conferring these powers, not to be confounded with them. 15. Conferring- but how? As itself possessing them or not? How can it convey what it does not possess, and yet if it does possess how is it simplex? And if, again, it does not, how is it the source of the manifold? A single, unmanifold emanation we may very well allow- how even that can come from a pure unity may be a problem, but we may always explain it on the analogy of the irradiation from a luminary- but a multitudinous production raises question. The explanation is that what comes from the Supreme cannot be identical with it and assuredly cannot be better than it- what could be better than The One or the utterly transcendent? The emanation, then, must be less good, that is to say, less self-sufficing: now what must that be which is less self-sufficing than The One? Obviously the Not-One, that is to say, multiplicity, but a multiplicity striving towards unity; that is to say, a One-that-is-many. All that is not One is conserved by virtue of the One, and from the One derives its characteristic nature: if it had not attained such unity as is consistent with being made up of multiplicity we could not affirm its existence: if we are able to affirm the nature of single things, this is in virtue of the unity, the identity even, which each of them possesses. But the all-transcendent, utterly void of multiplicity, has no mere unity of participation but is unity's self, independent of all else, as being that from which, by whatever means, all the rest take their degree of unity in their standing, near or far, towards it. In virtue of the unity manifested in its variety it exhibits, side by side, both an all-embracing identity and the existence of the secondary: all the variety lies in the midst of a sameness, and identity cannot be separated from diversity since all stands as one; each item in that content, by the fact of participating in life, is a One-many: for the item could not make itself manifest as a One-and-all. Only the Transcendent can be that; it is the great beginning, and the beginning must be a really existent One, wholly and truly One, while its sequent, poured down in some way from the One, is all, a total which has participation in unity and whose every member is similarly all and one. What then is the All? The total of which the Transcendent is the Source. But in what way is it that source? In the sense, perhaps, of sustaining things as bestower of the unity of each single item? That too; but also as having established them in being. But how? As having, perhaps, contained them previously? We have indicated that, thus, the First would be a manifold. May we think, perhaps, that the First contained the universe as an indistinct total whose items are elaborated to distinct existence within the Second by the Reason-Principle there? That Second is certainly an Activity; the Transcendent would contain only the potentiality of the universe to come. But the nature of this contained potentiality would have to be explained: it cannot be that of Matter, a receptivity, for thus the Source becomes passive- the very negation of production. How then does it produce what it does not contain? Certainly not at haphazard and certainly not by selection. How then? We have observed that anything that may spring from the One must be different from it. Differing, it is not One, since then it would be the Source. If unity has given place to duality, from that moment there is multiplicity; for here is variety side by side with identity, and this imports quality and all the rest. We may take it as proved that the emanation of the Transcendent must be a Not-One something other than pure unity, but that it is a multiplicity, and especially that it is such a multiplicity as is exhibited in the sequent universe, this is a statement worthy of deliberation: some further enquiry must be made, also, as to the necessity of any sequel to the First. 16. We have, of course, already seen that a secondary must follow upon the First, and that this is a power immeasurably fruitful; and we indicated that this truth is confirmed by the entire order of things since there is nothing, not even in the lowest ranks, void of the power of generating. We have now to add that, since things engendered tend downwards and not upwards and, especially, move towards multiplicity, the first principle of all must be less a manifold than any. That which engenders the world of sense cannot itself be a sense-world; it must be the Intellect and the Intellectual world; similarly, the prior which engenders the Intellectual-Principle and the Intellectual world cannot be either, but must be something of less multiplicity. The manifold does not rise from the manifold: the intellectual multiplicity has its source in what is not manifold; by the mere fact of being manifold, the thing is not the first principle: we must look to something earlier. All must be grouped under a unity which, as standing outside of all multiplicity and outside of any ordinary simplicity, is the veritably and essentially simplex. Still, how can a Reason-Principle [the Intellectual], characteristically a manifold, a total, derive from what is obviously no Reason-Principle? But how, failing such origin in the simplex, could we escape [what cannot be accepted] the derivation of a Reason-Principle from a Reason-Principle? And how does the secondarily good [the imaged Good] derive from The Good, the Absolute? What does it hold from the Absolute Good to entitle it to the name? Similarity to the prior is not enough, it does not help towards goodness; we demand similarity only to an actually existent Good: the goodness must depend upon derivation from a Prior of such a nature that the similarity is desirable because that Prior is good, just as the similarity would be undesirable if the Prior were not good. Does the similarity with the Prior consist, then, in a voluntary resting upon it? It is rather that, finding its condition satisfying, it seeks nothing: the similarity depends upon the all-sufficiency of what it possesses; its existence is agreeable because all is present to it, and present in such a way as not to be even different from it [Intellectual-Principle is Being]. All life belongs to it, life brilliant and perfect; thus all in it is at once life-principle and Intellectual-Principle, nothing in it aloof from either life or intellect: it is therefore self-sufficing and seeks nothing: and if it seeks nothing this is because it has in itself what, lacking, it must seek. It has, therefore, its Good within itself, either by being of that order- in what we have called its life and intellect- or in some other quality or character going to produce these. If this [secondary principle] were The Good [The Absolute], nothing could transcend these things, life and intellect: but, given the existence of something higher, this Intellectual-Principle must possess a life directed towards that Transcendent, dependent upon it, deriving its being from it, living towards it as towards its source. The First, then, must transcend this principle of life and intellect which directs thither both the life in itself, a copy of the Reality of the First, and the intellect in itself which is again a copy, though of what original there we cannot know. 17. But what can it be which is loftier than that existence- a life compact of wisdom, untouched by struggle and error, or than this Intellect which holds the Universe with all there is of life and intellect? If we answer "The Making Principle," there comes the question, "making by what virtue?" and unless we can indicate something higher there than in the made, our reasoning has made no advance: we rest where we were. We must go higher- if it were only for the reason that the maker of all must have a self-sufficing existence outside of all things- since all the rest is patently indigent- and that everything has participated in The One and, as drawing on unity, is itself not unity. What then is this in which each particular entity participates, the author of being to the universe and to each item of the total? Since it is the author of all that exists, and since the multiplicity in each thing is converted into a self-sufficing existence by this presence of The One, so that even the particular itself becomes self-sufficing, then clearly this principle, author at once of Being and of self-sufficingness, is not itself a Being but is above Being and above even self-sufficing. May we stop, content, with that? No: the Soul is yet, and even more, in pain. Is she ripe, perhaps, to bring forth, now that in her pangs she has come so close to what she seeks? No: we must call upon yet another spell if anywhere the assuagement is to be found. Perhaps in what has already been uttered, there lies the charm if only we tell it over often? No: we need a new, a further, incantation. All our effort may well skim over every truth and through all the verities in which we have part, and yet the reality escape us when we hope to affirm, to understand: for the understanding, in order to its affirmation must possess itself of item after item; only so does it traverse all the field: but how can there be any such peregrination of that in which there is no variety? All the need is met by a contact purely intellective. At the moment of touch there is no power whatever to make any affirmation; there is no leisure; reasoning upon the vision is for afterwards. We may know we have had the vision when the Soul has suddenly taken light. This light is from the Supreme and is the Supreme; we may believe in the Presence when, like that other God on the call of a certain man, He comes bringing light: the light is the proof of the advent. Thus, the Soul unlit remains without that vision; lit, it possesses what it sought. And this is the true end set before the Soul, to take that light, to see the Supreme by the Supreme and not by the light of any other principle- to see the Supreme which is also the means to the vision; for that which illumines the Soul is that which it is to see just as it is by the sun's own light that we see the sun. But how is this to be accomplished? THE REST OF THE ENNEAD BY PLOTINIUS 250 A.D.